Welcome to the Official Website of "The Shooter" Tony Jones. I have been competing in "wrestling" for over 15 years. After four years of amateur wrestling at Archbishop Riordan High School (www.wrestletech.com/crusaders), I went to San Francisco State University (http://athletics.sfsu.edu/men/wrestling/) and continued my amateur career for another 5 years. I graduated from SFSU with a Broadcasting degree in 1995. 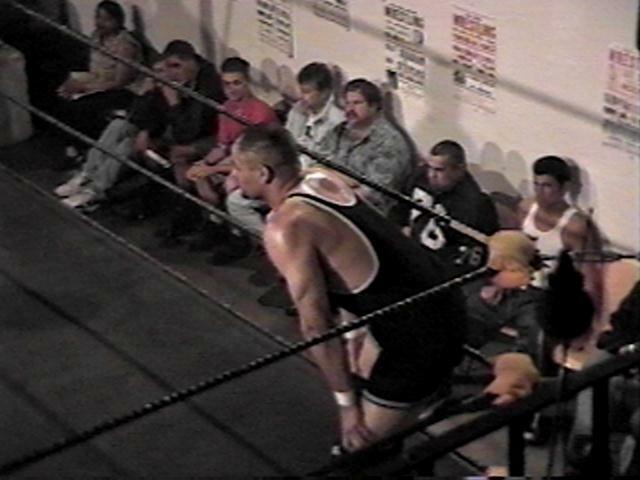 I joined a professional wrestling school, the All Pro Wrestling (APW) Boot Camp (www.allprowrestling.com). 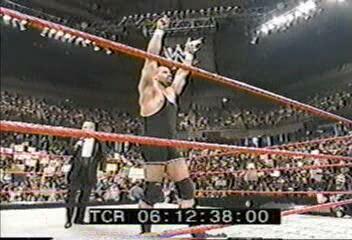 After over a year of training, I had my very first professional wrestling match in January of 1997. My first big opportunity came when Barry Blaustein, writer/director, came to APW in hopes of finding talent for his upcoming documentary, "Beyond the Mat," (www.beyondthemat.net). Barry selected Michael Modest and myself to do a feature about indy wrestlers trying to "make it in the business." In September of 1998, Mike and I wrestled a match for the World Wrestling Federation, which was used in the film along with our personal profiles. It was a true honor to go back to San Francisco State University, (http://athletics.sfsu.edu/men/wrestling/) five years after my last year of amateur wrestling competition, to wrestle for All Pro Wrestling's Halloween Hell 3 show on October 29, 1999 in the main event versus Michael Modest for the APW Internet Championship. I think my college wrestling coach, Lars Jensen, had a good time. After about a year of continuing work in the indys, I was asked to attend the WWF (www.wwe.com) Dojo training facility with Dr. Tom Prichard in November of 1999. In February of 2000, Terry Taylor gave me a tryout with WCW in front of Kevin Sullivan, Mike Graham, and Ric Flair. Taylor then asked me to attend the WCW Power Plant, which I did in May 2000. 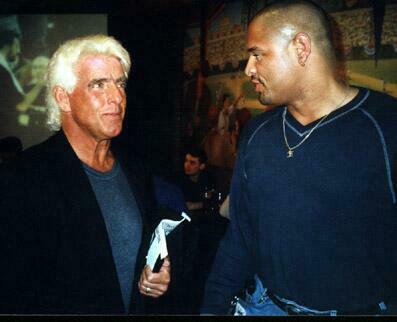 Here I am with my childhood idol, "The Nature Boy" Ric Flair. During that same period, I wrestled for two tours in Japan. In April and May of 2000, I worked for the BattlArts (www.ops.dti.ne.jp/~batbat/) promotion in Japan. I recently have worked shows for the Urban Wrestling Alliance (UWA), a new league in the process of receiving a national TV syndication deal. I have worked under the name, H.T.K., which stood for Hard to Kill, but later changed to, Honor, Truth, & Knowledge. 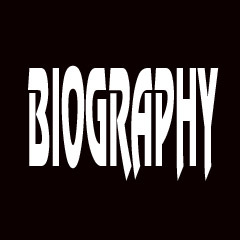 While working for many different independent organizations, I also work on a continuing basis for Ultimate Pro Wrestling (www.upw.com), which is a WWF developmental territory based in Los Angeles, California. I worked a television taping of WWF Jakked versus Raven of the World Wrestling Federation (www.wwe.com), on May 21st, 2001, in San Jose, California. I am available for bookings, so please contact me directly by email at shootertonyjones@comcast.net.